Richard Zaidan, Visitor Experience Manager of Wood Buffalo Provincial Park, points to this secluded treasure about 25 kilometres from Fort Smith. 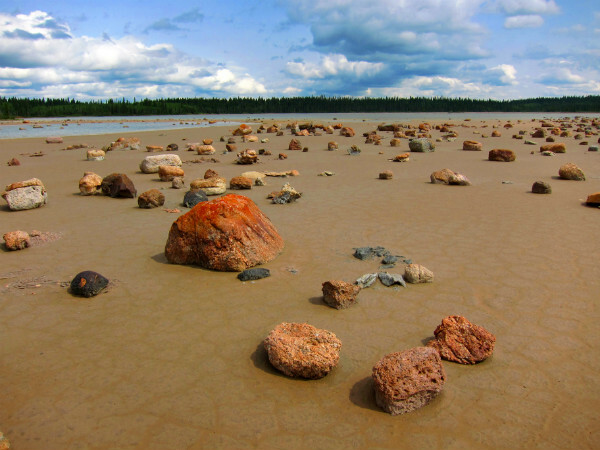 Surrounded by boreal forest, your first view of the red, clay-ringed lake stands out for its other-worldliness with the appearance of rocks left behind from glacial retreat some 10,000 years ago. The exposed salt flats and highly salty water contain 10 times the salt content of the ocean, delivering the best therapeutic sensation this side of the Dead Sea. These highly porous rocks form a visual moonscape and swimmers (between May and September) will float without effort. Even better, you are the only crowd you’ll encounter.